Georgia is a slice of sumptuous beauty, sandwiched between Turkey and Russia, on the coast of the Black Sea. We bike and hike the abundant geographical diversity of this country steeped in history as we venture from the heart of wine country, past monasteries that have stood for centuries, to the alpine meadows of the Greater Caucasus mountain range. 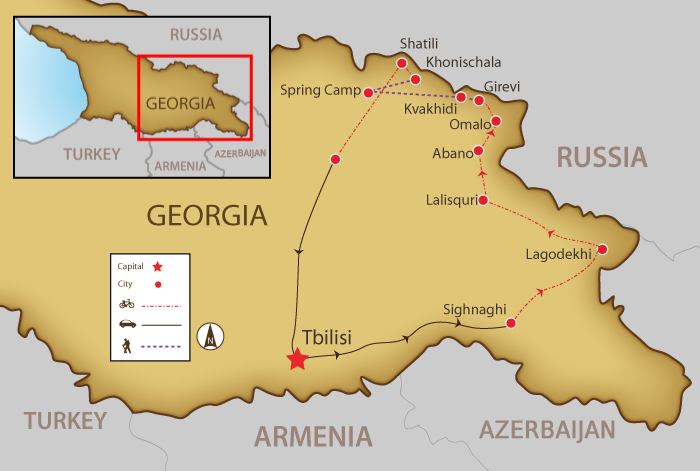 We start our adventure in Tiblisi, Georgia's capital city for nearly 1500 years, and, from the picturesque city of Signaghi, we hop on the bikes and pedal through the heart of Georgian wine country towards the forests of Lagodekhi National Park. Our route takes us along the ancient Silk Road, visiting villages on the old east-west trade route. Once we have reached the foothills of Tusheti National Park, the climbing begins in earnest as we cycle on dirt roads into the Caucasus Mountains and over the 2,850-m high Abano Pass, where we are gifted with magnificent views of snow-capped peaks. Following the course of the Chagma River will bring us to the fortified village of Omalo. One more day of climbing and descending through the ancient cities of Dartlo and Girevi before we set aside the bikes and begin our two-day hike across the wilderness. Accompanied by horses to carry our gear, we'll meet shepherds and their flocks as we reach our goal, Atsunta Pass (3,431 m). From there, we continue downhill to our campsite in the Khevsureti mountain region. We return to our bikes for two more day of riding and cycle to the UNESCO World Heritage Site of Shatili before our last climb over Datvis Jvari Pass and a transfer to Tbilisi for a farewell dinner. All in all, an amazing adventure through the Caucasus mountains! We meet up in the evening for a welcome dinner and trip briefing. The morning is free to relax and recover from any jet lag before an after-noon walking tour before heading to Mthskheta for a traditional Geor-gian dinner on the banks of the Mtkvari River. We transfer to Signaghi, nestled on the Kiziki Gorge for classic views of the Caucasus mountains and the Kakheti wine region. We lunch at Pheasants Tears winery and after some delicious fare, saddle up for our first fantastic bike ride to Lagodekhi National Park. Today’s long day of cycling takes us through the beautiful landscapes of the Kakheti wine region. We visit the 16th-century Gremi Monastery as we follow the old Silk Road and pass through the towns and villages that once were the main trading centres in Georgia. The real mountain biking starts as our entire route uses dirt roads that take us up through the high ranges of the Caucasus Mountains. We ride predominantly uphill and take about 7- 8 hours to reach our campsite at the top of the Abano Pass. A fantastic downhill ride starts our day! We cycle a dirt road following the Chagma River before a steep uphill ride from Kumelaurta to the village of Omalo, the capital of the Tusheti mountain region. Our guesthouse is located below the ancient Keselo Towers. Another fantastic biking day, full of unique villages, beautiful scenery, testing ascents, and thrilling downhill biking. From Dartlo, we follow the Pirikiti Alazani River to Girevi. We leave the campsite, load our gear onto pack horses, and start our two-day hike up and over Atsunta Pass. We hike through the ruined village of Chontio, the last village for a while. We cross the Atsunta Pass, and, if weather allows, we see the beautiful Mount Kazbegi in the distance. From here we continue down the Khevsureti Mountain region. We have a short hike to Khonischala to meet our bikes. We cycle to Mut-so and walk to the medieval fortified dwellings on vertical terraces above the Mutso-Ardoti Gorge. From there, we ride to the UNESCO World Heritage Site of Shatili. Our last mountain biking day. We ride to the Datvis Jvari Pass. From the pass, we have a fantastic descent through alpine meadows. Then we transfer to our Tbilisi hotel where we enjoy a farewell dinner. Transfer to airport for onward travel. Day 3 - Tbilisi - Singnaghi – Lagodekhi Ride 48km. +425m / -671m. I enjoyed this trip very much. It was physically challenging at times but the views were a great distraction from any discomfort. We loved the holiday. Georgia is a spectacular place to visit and we got to see a lot of it. The people were friendly and we learned a great deal. The horsemen and cook were amazing. Scenery stunning. Thanks for a great holiday. We cycle 379 km in 7 days of biking. We also hike for two full days. This is a tough trip due to the altitude and the terrain. We gain elevation slowly to ease acclimating and never sleep at higher than 3,000 m. Due to the remoteness of the terrain, we’ll be camping for five nights. It is the combination of conditions – altitude, weather, topography, and overall environment – that makes this a challenging tour and a test of sustained riding. Vehicle support, which allows cyclists the option to get into the truck as needed, is available on all cycling days. During our hikes, we'll be accompanied by horses that can also carry any tired trekkers. Suitability: This trip is designed for the experienced cyclist with a high level of fitness. The lack of oxygen at the high altitudes we’ll be cycling at, as well as the climbs we’ll be doing, means that this is a tough trip, and you'll enjoy it much more if you have a good level of stamina and fitness. The distances and gradient each day are not extreme, but getting into the best shape possible for the trip will ensure you get the most from your holiday. Biking Conditions: The road surfaces are a mix of paved and dirt roads, and a few sections of single track. The paths may be rocky in sections and therefore good technical skills on a mountain bike are necessary. Upon arrival in Tbilsi, we transfer to our hotel and meet up in the evening for a welcome dinner and trip briefing. After breakfast, your morning is free to relax and recover from any jet lag, maybe with a traditional sulphur bath and massage. We then meet in the afternoon after lunch for a tour of the town. Tbilisi is one of the most ancient cities of the Caucasus, and walking through the well-preserved old town is a distinctive pleasure. We tour the city on foot and visit Metheki Church and Sioni Cathedral, then stroll along the charming Rustaveli Avenue. On a clear day, it is possible to see the mighty peak of Mt. Kazbek jutting from the Greater Caucasus in the north. We take an evening drive to the beautiful ancient town of Mth-skheta for a traditional Georgian welcome dinner on the banks of the Mtkvari River. We leave Tbilisi after breakfast for a 90-minute transfer to the town of Signaghi. Nestled on the Kiziki Gorge, this is one of the most beautiful towns in Georgia. Overlooking the Alazani Valley, Signaghi is a rare and beautiful example of a historic city which has maintained its style through the years: open balconies, unique fortresses, towers, and churches plus a friendly population. From Signaghi, we have classic views of the Caucasus Mountains and the wine region of Kakheti, where the Alazani River flows into the Mingechauri Reservoir near the Azeri border. We have lunch at Pheasants Tears winery and after some delicious fare, we saddle up for our first fantastic bike ride to Lagodekhi National Park. Today is a long day of cycling, but our route takes us through the beautiful landscapes of the Kakheti wine region. After a short transfer, we cycle on quiet back roads, and part of the route takes us on paths through surrounding vineyards. We visit the 16th century Gremi Monastery as we follow the old Silk Road and pass through the towns and villages that once were the main trading centres in Georgia. We push on enjoying the refreshing landscapes and reach our overnight destination of Laliskuri, where we have a grand dinner accompanied by some local vino. After an early morning breakfast, a short transfer takes us to the start of our ride toward Tusheti National Park. Now is when the real mountain biking starts as our entire route uses dirt roads that take us up through the high ranges of the Caucasus Mountains. Today's ride is a testing one as we ride predominantly uphill for about 7- 8 hours to reach our campsite at the top of the Abano Pass (2,850 m). After breakfast. we have the prize of fantastic downhill biking for the first half of the day. We ride a dirt road following the Chagma River before an 8-km steep uphill ride from Kumelaurta to the village of Omalo, the capital of the Tusheti mountain region (2,100 m). Our guesthouse is located below the Keselo Towers, an ancient defense which offered protection to the inhabitants of old Omalo from the invading Mongols and later the Daghestani tribes. We have the option to hike in the evening up to the Keselo towers. Another fantastic biking day is ahead of us, full of unique villages, beautiful scenery, testing ascents, and thrilling downhill biking. From the village of Dartlo, we follow the Pirikiti Alazani River until we reach our campsite in the village of Girevi. This where we say goodbye to our bikes for the next two days as we start our hike to the village of Mutso. Early in the morning, we leave the campsite, load our gear onto pack horses, and start our two-day hike that takes us up and over the 3,431-m Atsunta Pass. After Girevi, we hike through the ruined village of Chontio, the last village we see as beyond here we only encounter far-flung shepherd’s homes in the remote high Caucasus. We have a long eight-hour day of hiking, but the journey is full of enjoyable moments and fantastic scenery. For those who need a few minutes off their feet, we have a couple of willing horses to carry you for a few kilometres. After a breakfast of champions, we pack up and leave the campsite early. We cross the Atsunta Pass, and, if the weather allows, we will be able to see the beautiful Mount Kazbegi in the distance. From here, we continue downhill to the Khevsureti Mountain region. Hiking from our campsite to the top of the pass will take about 3 hours, and from the pass it is another 3-4 hours of mostly downhill, but not very steep, walking. This morning's hike will be short, around an hour, down through a birch forest to the Khonischala area, where we meet our bikes to start riding through the Khevsureti mountain region. We head to the village of Mutso and walk to the medieval fortified dwellings arranged on vertical terraces above the Mutso-Ardoti Gorge. From there, we ride to the UNESCO World Heritage Site of Shatili. The village is a complex of medieval-to-early modern fortresses and fortified dwellings that functioned both as residences and a fortress guarding the northeastern outskirts of the country. Some 60 towers cluster together to create a single chain of fortifications. We overnight at a guesthouse in Shatili. Today is our last mountain biking day. After breakfast, we start our ride towards the Datvis Jvari Pass (3,047 m). From the pass, we have a fantastic descent through alpine meadows. Around 5 pm, we get in our minibus and transfer to our Tbilisi hotel where we enjoy a farewell dinner on the Hotel Kopala terrace. Citizens of EU countries, the US, Canada, Japan, Israel, Switzerland, Norway, Iceland, and Liechtenstein do not need a visa to visit Georgia for up to 90 days. If you’re not from one of the above countries, you may obtain a visa from a Georgian embassy or consulate. The standard fee for a 90-day, single-entry ‘ordinary’ visa, which covers tourism, is 60 GEL or its equivalent. The best times to visit Georgia is from May to September, when it is warm and sunny. July and August can be particularly hot and humid in many parts, and temperatures regularly reach 40°C, however, this is an excellent time to be in the mountains, where it is sunny and cool. This is also the peak season on the Black Sea. There is a surprising amount of rain year-round. Meals are included as per the itinerary where B = breakfast, L = lunch, D = dinner. Regardless of the reason for coming together, the Georgian table and its selection of dishes provides a fascinating insight into a unique culture. Georgian cuisine makes use of animal products in most dishes and is rich in herbs, spices, dairy products, and oils. Most key ingredients are easily recognizable but the methods of preparation, which are the time honored secrets of the Georgian chef, lend a special taste and quality to each particular dish. There is no doubt that, regardless of your dietary preference, there is something to tantalize the taste buds. We shall make sure you sample as much local cuisine as possible. Any special dietary requirements can also be catered for as well, please let us know at the time of booking. Keeping you completely hydrated is a job we take very seriously. Cold water, some energy-restoring local snacks and are included in the tour price while riding. Soft drinks and other beverages during meals are not included. You may also want to bring electrolyte in powder or tablet form. Alcoholic drinks are available everywhere, but are NOT included in the price. We recommend that you tuck away a few extra euros for possible incidentals that might arise. It is always wise to have some paper currency in case ATMs are out of order or credit card problems. This will save you a lot of unnecessary worries. The currency of Georgia is the lari (GEL). One lari is made up of 100 tetri (still referred to by many people as kopecks!). ATMs, generally accept MasterCard, Visa, Cirrus and Maestro cards, are plentiful in cities and most towns. They all issue lari and a few will dispense US dollars as well. There are also plenty of small money-exchange offices in most towns and cities; they usually take US dollars, euros or Russian roubles. It’s useful to have some of these currencies in cash for times when there isn’t a convenient ATM nearby. You can make purchases with credit cards at the better hotels, restaurants and some shops in Tbilisi, but much less frequently outside the capital. Travellers cheques can be exchanged only in some banks.